Portadi is a cloud access panel for workplace apps. Portadi increases productivity - users see a complete list of work apps available to them and can sign in, without usernames and password, to any of their business accounts and apps. Security is a big part of the offering - Portadi removes the need to disclose login credentials to users. Portadi puts admins and managers in control - they can see which apps are used in the company, who uses them, and how often. Portadi works with Chrome, Firefox and Safari. While watchman Monitoring does not have a policy against account sharing within your organization, we find our users get better support when logged in to their own account. Therefore, we recommend adding Watchman Monitoring as a Private App to each Portadi account. From your individual Portadi account, click "Add app"
Select "This is my Private Account"
Now Watchman Monitoring will show up as a private app in your Portadi. 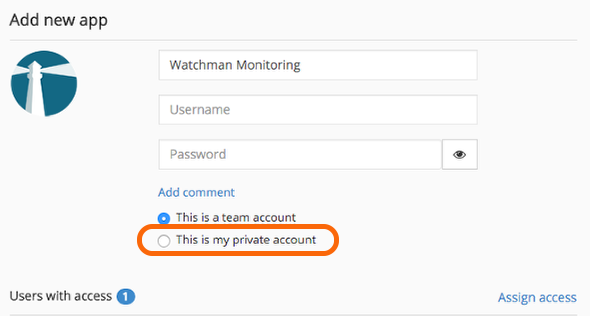 To sign in, just select "Watchman Monitoring" and Portadi will log you in to your Watchman Monitoring Dashboard.